This analysis explores the presence of history-related content in the programming offered by nationwide television networks in Spain from two different angles. The first part has focused narrowly on content broadcast to mark the anniversaries of five historic events in contemporary Spanish and world history whereas the second has examined a broader range of history-related content featured by the same channels during the months of November 2015 and March 2016. Approval of the Spanish Constitution by referendum 6 Dec. 1978 1983, 1988, 1993, 1998, 2003, 2008, 2013. Outbreak of the Spanish Civil War 18 July 1936 1981, 1986, 1991, 1996, 2001, 2006, 2011, 2016. End of the Spanish Civil War 1 April 1939 1984, 1989, 1994, 1999, 2004, 2009, 2014. Outbreak of the Second World War 1 Sept.1939 1984, 1989, 1994, 1999, 2004, 2009, 2014. End of the Second World War 2 Sept. 1945 1985, 1990, 1995, 2000, 2005, 2010, 2015. The sample for the first part of this analysis was composed of content drawn from daily broadcast schedules from late 1980 through early 2016 coinciding with five-year intervals of the anniversaries of the events listed above as well as related material aired during the days leading up to and succeeding the exact dates of these anniversaries and at any point during the following weekends. One of the objectives of this exercise was to evaluate how television currently contributes to spectators’ memory of their collective past. After relevant programmes had been identified and tallied and their duration in minutes recorded, the time slots in which they had appeared were analysed to determine the audience segments they had targeted and whether those segments could be considered prime-time audiences. Attention was also paid to the genres in which material related to the events in question were presented. The same criteria were also applied during the analysis that comprised the second phase of the study, which focused on a broader spectrum of history-related content broadcast by the same channels during the months of November 2015 and March 2016: the number of programmes with a historical focus or slant aired during the periods of interest, their duration in minutes, the time slots they had been assigned and the genres into which they could be classified. Broadcast schedules were reconstructed on the basis of television listings published by the nationally distributed Spanish dailies Abc and La Vanguardia, both of which maintain online archives. The scope of the study was limited to content broadcast by general interest channels with national audiences operational during the entire period in question (see Table 2). Quantitative content analysis revealed that some of the historic events used as references for this study received far more attention than others in terms of the number of programmes devoted to them and the minutes of airtime these were allotted. For example, whereas ten programmes representing a total of 14 hours of airtime were broadcast on or near anniversaries of the referendum on the Spanish Constitution, only two programmes that together accounted for a mere 4 hours (240 minutes) of programming time were aired on or near anniversaries of the dates marking the outbreak and end of the Spanish Civil War. Programming related to the beginning and end of the Second World War, which ranked a distant third, was limited to one twenty-minute documentary devoted to American veterans who served during that conflict. The findings of this part of the study indicate that mainstream Spanish television channels serving nationwide audiences place more emphasis on relatively recent events that have had a direct impact on Spain and the lives of its citizens than on events that have taken place elsewhere and have implicated and affected the country and its people to a lesser degree. Nevertheless, what appears to be a conspicuous lack of televised content commemorating the specific dates of the outbreak and end of Second World War becomes more understandable if one factors Spain’s status as a neutral country throughout this conflict into the equation. A close examination of programmes scheduled to coincide with anniversaries of the 1978 referendum on the Spanish Constitution falling within study time frames (Table 3) revealed that all fit neatly within genres associated with classic journalism. It also established that public television channel TVE 1 devoted vastly more airtime than its competitors to commemorations of this event. The strong journalistic approach taken by the three channels that featured constitution-related programming indicates not only the importance of such events in contemporary Spanish history but also their impact on Spanish political and media discourse throughout the period. Although the constitution is a recurring reference in Spanish political and social discourse, the programmes in the sample focusing on this topic were clearly commemorative in nature and the overwhelming majority were aired in 1998 and 2003 to mark the twentieth and twenty-fifth anniversaries of the event. These programmes focused on well-known personalities. One was heavily biographical (La noche de… Suárez), but most were interview shows featuring experts and current political figures (El primer café and Los desayunos de TVE) or individuals who had played a role in the framing and articulation of the Constitution (La mirada crítica, La Clave). All of them tended to portray contemporary Spanish history as the fruit of individual initiatives and sweep historical realities and economic, social and demographic questions under the rug. In contrast to the attention they have paid to the sucessive anniversaries of the Constitutional referendum of 1978, mainstream television channels have done little to commemorate the anniversaries of the outset and conclusion of the Spanish Civil War. Only two such programmes were identified in the sample: the first was a documentary aired on La Sexta in 2006 and the second a historical drama broadcast by La 2 in 2016 (see Table 4). It is worth noting that both channels (one public and one private) have comparatively low audience shares. The paucity of programming commemorating the anniversaries of the outset and end of the Spanish Civil War could possibly stem from a desire on the part of Spanish broadcasters to avoid dwelling on painful historical issues that continue to divide Spanish society today and are habitually over-exploited during election campaigns. The only programme in the sample aired on or near the dates marking anniversaries of the beginning and end of the Second World War (Table 5) was the previously mentioned documentary about recipients of the highest honour conferred by the U.S. military. The lack of programming in this category apart from this single documentary, which was broadcast by La 2 in 1981, could be perceived as an indicator of a notable lack of on the part of Spanish networks in this particular aspect of world history. 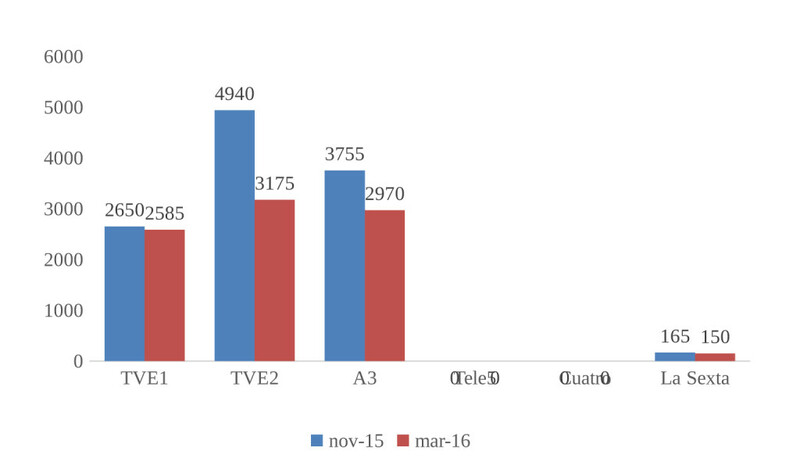 The initial revelation of the quantitative analysis of mainstream television schedules for November 2015 and March 2016 was the complete absence of history-related content on Mediaset channels Tele 5 and Cuatro (see Figure 2), a pattern that nevertheless conforms to the group’s strategy of focusing on sports broadcasts and sensationalist programmes with mass appeal such as reality and talk shows. Apart from a few sporadic programmes featured on Antena 3, all of the history-related content aired during the two periods studied was broadcast by either a public network channel or Antenna 3. Nevertheless, the bulk of this programming was offered by the two public channels included in the study, whose statutes establish their “obligation to inform and offer programming covering all spheres of general interest of educational and entertainment value to the public”. A breakdown of the total minutes of the history-related content in the second sample by time slot reveals that most was aired during peak audience “prime time” hours (see Table 6). The scheduling of almost all of the channels covered in this study followed this pattern. 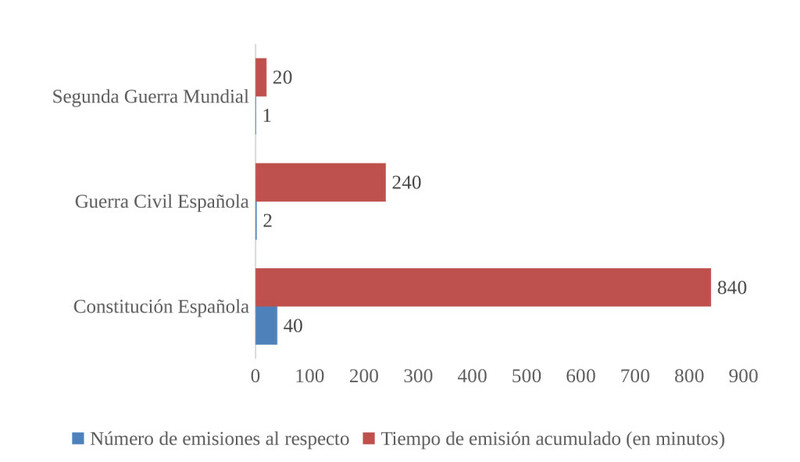 The substantial number of history-related programmes aired during late morning, early afternoon and late night slots as well support the conclusion that Spanish audiences have a strong interest in this type of content. A breakdown of programmes aired by genre helps explain Spanish television audiences’ fascination with history: it is almost invariably served up in the guise of fiction. As can be seen in Table 7, drama series, adventure series, telenovelas and full-length feature films made up 82.45% of the history-related content aired by study channels during November 2015 and March 2016. Mainstream television networks’ overwhelming focus on fiction stands in sharp contrast the space they allotted to documentary programmes, which accounted for a mere 3.51% of overall programming. Nostalgia programmes, which had a notable presence on La 2, made up the remaining 14.04%. Although programmes that banked on nostalgia cannot be said to have focused on history per se, they did incorporate stock footage drawn from the Televisión Española archives that shed light on certain social and cultural facets of Spanish life from the 1960s onwards. That most of the programmes in the sample falling into this category had been presented on TVE1 and TVE2 is not surprising given these channels’ access to their network’s audiovisual holdings, which are far more extensive than those of their competitors. Telenovelas, which accounted for 30.53% of fiction programmes, constituted the largest subgenre within this general category. This part of the sample included episodes from the 2015 and 2016 seasons of Amar es para siempre (Antena 3) and Acacias 38 (TVE 1), two long-running daily serials set in different periods of Spanish history. Although these series have vintage sets and costumes and their scripts are spiced with scattered references to historical events and figures, their characters (whose aspirations and mentalities frequently fail to reflect those of the period in question) toil their way through standard plots and subplots centred on power struggles and impulses such as love, hate, rivalry, jealousy that could just as well, if not better, be explored in a more contemporary setting. The more veteran of the two, Amar es para siempre, which is now enjoying its fifth uninterrupted season on Antena 3, constitutes a continuation of an earlier series that ran for seven seasons on TVE under the title Amar en tiempos revueltos. The twists and turns of this never-ending saga set in the 1960s revolve around the lives and personal dilemmas of the habitués of a fictional neighbourhood bar in Madrid by the name of El Asturiano. Acacias 38, which is aired during the same afternoon time slot on public television and is now in its second season, narrates the stories of four late nineteenth-century bourgeois families and their respective maids. This series relies on stereotypical characters divided into two clearly defined camps: the poor, who are caught up in a perpetual struggle to survive, and the rich, who from time to time become aware that money cannot buy happiness. The third programme in this category, El Secreto de Puente Viejo, which like the other two daily serials mentioned has more historical cachet than substance, has just begun its sixth season on Antena 3. The action of the 1,390 episodes broadcast as of the time of this report takes place in Spain during the first three decades of the twentieth century. This programme is broadcast immediately after the previously mentioned Amar es para siempre. Águila Roja, a weekly prime-time swashbuckler now in its ninth season on public channel TVE 1, fits neatly into the subgenre of adventure series. The adventures of this show’s characters (which have filled 109 episodes to date) take place in the seventeenth century during the reign of Philip IV. Although the storylines of Águila Roja provide a vague picture of the effects of the economic crisis in Spain during the period portrayed and make references to conflicts in which the country was then embroiled such as the Portuguese rebellion, the scriptwriters of this series take broad liberties with events and figures of the Spanish Golden Age. Four weekly series with historical themes were being aired during the period examined: two on TVE 1 (El Caso and Carlos, Rey Emperador), one on Antena 3 (Velvet) and one on La 2 (Los jinetes del alba). The group included only one biopic: Carlos, Rey Emperador, a seventeen-episode TVE series that traced the reign of the sixteenth-century Spanish ruler Charles I (referred to in the context of his role as Holy Roman Emperor as Charles V). This series constituted a chronological follow-up to Isabel, a much longer and highly successful historical drama series based on the life of Queen Isabella I broadcast on TVE 2012-2014. The rest of the programmes in this category had obviously been tailoured to cater to public interest in shows with a vintage look and feel. El Caso was a weekly detective fiction series set in the 1960s inspired by a real sensationalist tabloid of the same name once published in Spain. This show, which sought to recreate the atmosphere in which crime reporters worked during the period, provided an exposé of a different crime every week spiced with various subplots focusing on the professional and amorous exploits of staff journalists. Velvet, a series set in an exclusive Madrid department store at the height of the 1950s, traces the romantic relationship between a humble seamstress and the heir to a fashion empire. Although conceptually similar to the late afternoon series Amar es para siempre, Velvet is presented in a prime time slot. This show is currently in its fifth and final season. The last programme in this category was Los jinetes del Alba, a miniseries on La 2 about the travails of a bourgeois family caught up in the violence of the Asturian miner’s revolt of 1934. As in other cases, the historic events alluded to in this series serve primarily to provide a context for the passions and ambitions of its characters. The staying power of some of these series (Águila Roja, Amar es para siempre, El Secreto del puente viejo and Velvet) is a clear indication of their success with Spanish audiences. Also popular were El Mundo de Águila Roja and El mundo de Carlos V, “behind-the-scenes” companion series highlighting the periods in which the dramatic series Águila Roja and Carlos, Rey Emperador were set and the actual historic figures on which their characters were based. These series presented in tandem with their blockbuster counterparts accounted for 41.35% of the total nonfiction programmes in the study sample. Not so much documentaries as highly self-referential and metareferential “making of” episodes that provided little or no additional historical information, both were obviously conceived and aired as part of the network’s marketing strategies. The large number of full-length classic films in the sample, which were all aired on a single channel, corresponded to Historia de nuestro cine, a daily programme broadcast by La 2 that showcases vintage Spanish movies. Almost all of the historical drama movies broadcast within the time frames analysed fell into the Peplum category. Given that Peplum movies were invariably shown during the early afternoon time slot, one can safely assume that the channel airing them (once again La 2) viewed them as low-budget filler. Disaster movies appear to have served the same purpose. Films broadcast during the prime-time part of programming schedules, which, as mentioned previously, is the peak audience time slot, were more rigorous in terms of historical content and focus. These included two full-length feature foreign biopics, one of which appeared on La 2 and the other on La Sexta. The first (The Iron Lady, Phyllida Lloyd, 2012) was a narrative account of the life of former British Prime Minister Margaret Thatcher, and the second (J. Edgar, Clint Eastwood, 2011) explored J. Edgar Hoover’s tenure as head of the United States Federal Bureau of Investigation. Both of these films focused on figures of political importance in countries other than Spain during the second half of the twentieth century. The third biopic identified in the sample (Tarancón, el quinto mandamiento, Antonio Hernández, 2011) was a made-for-television movie about Cardinal Vicente Enrique y Tarancón, a cleric who played a key role in the Spanish Transition. This was presented during a late-night viewing slot on TVE 1. The fact that foreign biopics focusing on political figures in other countries would be assigned better time slots than a Spanish film about an individual who played an important role in recent Spanish history is striking. Nevertheless, such a difference in scheduling may well have had more to do with the nature of distribution agreements and the relative quality of the three productions in question than network editorial strategies. History is clearly present in a variety of formats on all of the mainstream television channels in Spain with the exception of those owned by Mediaset, a network with a narrow focus on popular and sensationalist content. Findings indicate that history tends to surface in televised content for two basic reasons. The first is its dual centrality to routine newscast commemorations of anniversaries of past events and current political discourses and agendas. Marking the anniversaries of historic moments is a longstanding tradition in television journalism that normally involves presenting the opinions of experts and firsthand accounts of individuals directly involved in a way that offers (at least in appearance) a balanced summary of the events being commemorated. The second is its perennial usefulness as a means of providing a distinctive setting for fiction productions such as costume and other types of drama series. The history component of these types of programmes (apart from exceptional cases such as the Carlos, Rey Emperador series mentioned earlier) tends to be used to give otherwise hackneyed tales of passion and ambition a veneer of sophistication. Most of the historical fiction series being aired on mainstream television channels in Spain contain just enough historical elements to lend them a vague air of authenticity and otherwise rely on stereotypes that support a facile sort of character development that mass audiences find easy to follow and understand. Rich characters are invariably bad and poor characters inevitably good and hardworking. Characters in period television productions also tend to be endowed with contemporary traits and mindsets that make it easier for spectators to identify with them and their problems. Female characters must therefore be portrayed as strong, determined women that triumph in the end but always need to find a stable romantic partner and establish a family in order to feel truly fulfilled. Aware of the strong pull that fiction can have, network producers are often tempted to churn out companion documentaries with a strong marketing component that play on spectators’ need to learn more about the characters they have come to identity with. Television writers and producers look to history for inspiration because history sells. They may, however, for a number of reasons, consider some aspects of history to be marketable than others. Contrary to the assertion made by some authors that Spanish television networks are making an earnest attempt to educate the public about some of the more controversial and unresolved aspects of contemporary Spanish history, none of the content examined during this study explored the pending issues that the Law of Historic Memory enacted under the Zapatero administration in 2007 was intended to address. History is, indeed, a winning ticket that sells – the perfect commodity for television spectators interested in taking vicarious journeys back in time but sufficiently close to what they consider home. Mainstream networks continue to steer clear of potentially divisive aspects of recent Spanish history exploited by parties on both ends of the political spectrum and focus on style and sentimentality rather than substance. The upshot is that audiences not only remember historical events commemorated or dramatised on television better than others, but also view them from television’s oversimplified and biased perspective.